Crude tumbles: Are Iran sanctions no big deal? Gold on the bubble… decent economic numbers (with a caveat)… pipelines and politics… and more! For once, a trade war headline isn’t dragging down the stock market — well, not much anyway. This morning the International Monetary Fund issued a report warning that growing trade tensions amount to “the greatest near-term threat to global growth” — and the United States is especially vulnerable. But the reaction from Wall Street is a collective yawn. As we write, the Dow is flat and the Nasdaq is off less than a quarter-percent from Friday’s record close. “The markets don’t care about the trade war,” says Alan Knuckman — our eyes and ears in the Chicago options trading pits. Yes, the bears growled last week after Donald Trump had his team draw up a list of $200 billion in additional Chinese imports that might be subject to U.S. tariffs. But the Dow — the index whose companies are most exposed to trade war fallout — ended the week up 2%. “All the bad news has already been priced in,” says Alan. He has a point. This morning’s Wall Street Journal tells us that since the United States and China imposed tariffs on $34 billion of each other’s goods on July 6… the Dow and the S&P 500 have registered gains on all but one day. And now on the second trading day of earnings season… trade wars take not only a back seat, they might be getting stuffed in the trunk. And now today Bank of America bagged $7 billion in profit for the quarter. Here’s the key about this earnings season: “Compared with the first quarter, analyst expectations are much lower in Q2,” Alan tells us. There’s nothing like positive earnings surprises to destroy short sellers — the Wall Street movers and shakers who make big bets that a company’s share price will fall. We told you all about the short sellers on Friday. When they’re proven wrong on a given company — and it happens all the time — you can profit huge. Recently, Alan unveiled a new strategy to profit from the short sellers’ blunders. “The more shares short sellers have to cover,” he elaborates, “the bigger our gains stand to be as companies start beating analysts’ cautiously low expectations. Sound intriguing? During a special “Fast Fortunes Summit” this week, Alan will reveal how this strategy works… and how it can pad your retirement portfolio to the tune of $11,000 in a single day. The summit is set for this coming Wednesday at 1:00 p.m. EST. That’s less than 48 hours from now. Click here for details. Please note attendance is limited, and the available spots are filling up fast. For that reason, we’re limiting sign-ups to only 200 for the next hour. If you click the link and it’s dead, please try again later. We’ll do our best to accommodate as many interested readers as we can. Crude prices are cratering this morning, which prompts the following question: What if the biggest threat to global growth is not trade wars but rather the Trump administration’s attempted crackdown on Iran? Earlier this morning, the front page of the Financial Times played up the story that Washington would not grant exemptions to European companies hoping to continue doing business in Iran despite new U.S. sanctions. With that, a barrel of West Texas Intermediate has sunk nearly $3 to $68.31 — a level last seen three weeks ago. We suspect a lot more of this back-and-forth is coming — just as we’ve seen with the trade wars. But the risks here are higher, because the U.S. dollar’s future as the global reserve currency is at stake. We won’t rehash all the reasons that’s the case today — here’s a refresher from late May if you’re interested — but the Russians and the Chinese are eager to get out of the SWIFT global payments system, where it’s dollars only, thank you very much. Gold is once again hugging the $1,240 danger zone we’ve mentioned for the last 10 days or so. The pop past $1,260 sure didn’t last long. Not much more to say at this point. Chart-watchers say if $1,240 gives way, the next support level is in the neighborhood of $1,200–1,210. The day’s economic numbers? All good. Retail sales jumped 0.5% in June, according to the Census Bureau. Remarkably the growth was driven by auto sales and restaurant meals. Restaurant meals are the very definition of “discretionary spending”… and at this stage of the post-2008 recovery, a new vehicle is also a “want to have,” not a “have to have.” For the moment anyway, consumers are feeling flush. In the first glimpse into how the economy’s doing in July, the Fed’s Empire State Manufacturing Survey clocked in at a healthy 22.6. The factory sector in New York state has been in terrific shape for more than a year now. 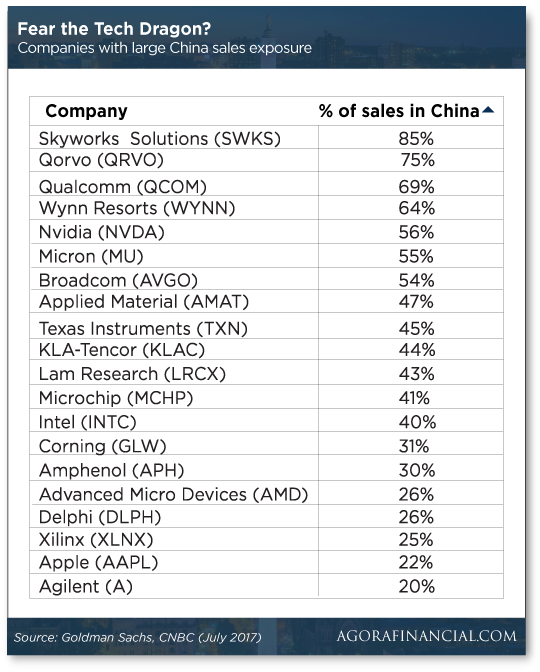 “If the trade war is real, you’d hardly know it from looking at the bones of the tech market,” says Ray Blanco on the science-and-wealth beat. But as we mentioned a short time ago, the Nasdaq powered to a record high on Friday. Meanwhile, one of Ray’s long-time tech favorites is hitting its stride as it gears up for holiday sales of electronic gadgetry. Ray sang the praises of Nvidia here last week, but there’s still more to the story: “NVDA will likely be releasing a new version of its gaming graphics chips this fall — just in time to supply the surge of gamers hungry for more powerful chips. “And it’s not just gaming chips. The chip content in automobiles is skyrocketing as they get smarter, safer and easier to use. It shouldn’t get easier than a self-driving car that responds to voice commands! “Plus, the growing internet of things, as well as the biggest tech infrastructure upgrade in history in the form of 5G, will also drive steep demand for years to come. [Ed. note: This coming Friday, Ray will release the results of his most important investigation during his eight years at Agora Financial. Wow, how did we miss this? The Kodak KashMiner is not to be. In an attempt to become relevant again, the photography dinosaur Eastman Kodak teamed up earlier this year with an outfit called Spotlite USA to roll out a Kodak-branded bitcoin mining computer. “Spotlite planned to let people pay an upfront fee of around $3,400 to rent a KashMiner, and would let customers keep a cut of any bitcoins generated,” reports the BBC. Crypto mining computer… or the battery pack from a ‘77 AMC Matador? Cosmetics aside, critics labeled the device a “scam” — pointing out that the cost of mining bitcoin was rising at such a fast clip that the promise of $375 in monthly income was fantasy. Now Spotlite USA has pulled the plug. 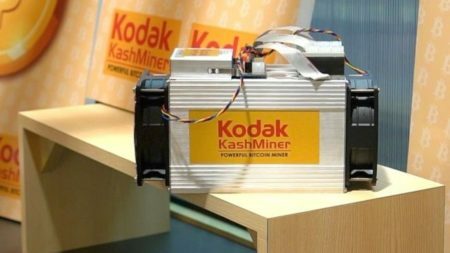 Kodak shares quadrupled from $3 to $12 in January with the announcement of both the KashMiner and a cryptocurrency called kodakcoin — a venture that still appears to be ramping up. KODK is now back to $4. “I hesitate to point out you leaving off the cost of the Russian/German pipeline construction and usage fees (You are aware of usage fees, I hope). The 5: Fees, schmees. Our main point — and maybe we should have emphasized it more — is that the notion of Germany being “captive to” Russia because of its reliance on Russian natural gas is overblown. It’s a notion pushed by both Trump and his Russophobic critics… and it’s nonsense. “Russia’s main money earner comes from exporting oil and gas, and minerals,” points out the veteran foreign correspondent Eric Margolis. “Except in wartime, it’s unlikely Moscow would shut the taps on its vital… pipelines.” Exactly. Meanwhile, “dislike of Trump”? We’re sorry if you’re offended that we hold Trump to the same standards as any other politician. But you, sir, have been reading us long enough to know we’re not in the other camp, either. We’re pleased that the tax cuts are structured in a way that perhaps 95% of taxpayers have more money in their pockets. But without accompanying spending cuts, it just means more debt piled onto our backs in the future. Enjoy the sugar-high prosperity while you can — buy a new car, go out to dinner, let that discretionary-spending flag fly — because you’ll be paying for it later. And Trump has been a total bust in his choices to staff the Federal Reserve. He could have radically re-made the central bank with five vacancies out of seven total positions on the Board of Governors — but he’s opted for egghead economists and/or career Fed apparatchiks. P.S. It’s been nearly two years since Jim Rickards offered this opportunity. Many people were left out. Now, he’s opening it up again. For only 48 hours. As you can tell, it’s a time-sensitive opportunity. Follow this link right away to check it out.